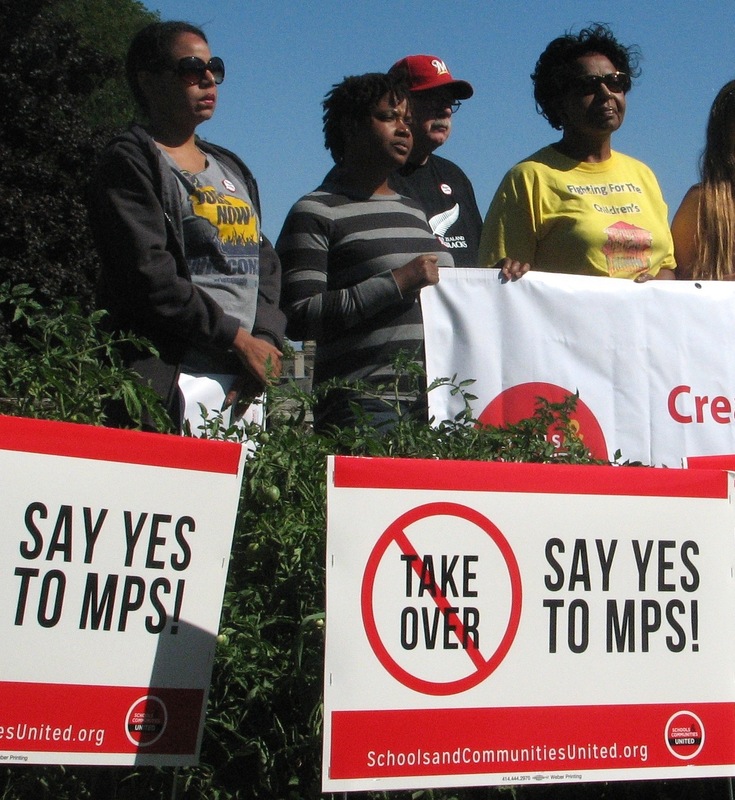 A coalition of Milwaukee civic groups is vowing to fight a new measure that allows Milwaukee County to take over struggling public schools, saying the plan will ultimately disenfranchise minorities who are concerned about their children’s education. Schools and Communities United, a coalition of 22 community, labor, religious and civic organizations, is also voicing its disapproval with recently passed state laws that limit the power of the Milwaukee County Board and expand the state’s private school voucher program. “We are here today to say enough is enough. 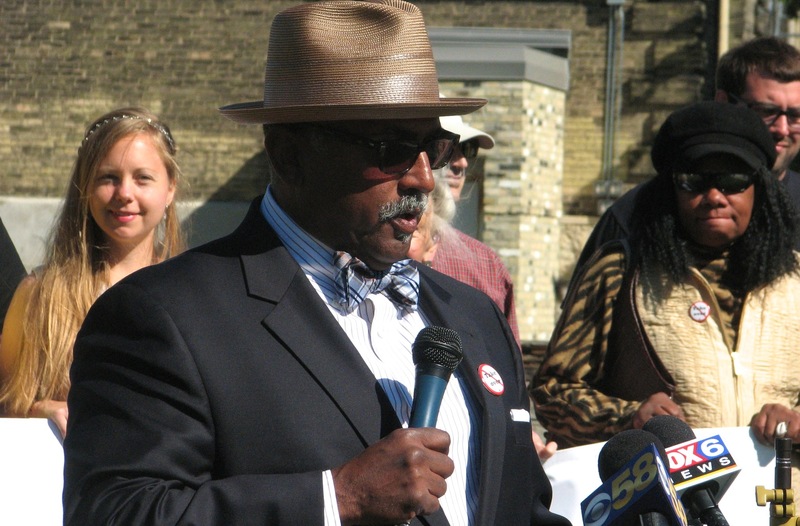 Stop these regressive policies,” said Fred Royal, the president of the Milwaukee chapter of the NAACP during a rally across the street from Bradley Tech High School to commemorate the 50th anniversary of the Voting Rights Act. State lawmakers this summer passed a provision in the state budget allowing Milwaukee County Executive Chris Abele to assume authority over “non-performing” Milwaukee public schools and creating a separate school district. He also has the authority to appoint a commissioner to oversee the newly created district. The appointed commissioner will have the option to manage the schools or turn them into private or charter schools. Three schools are allowed to be selected this school year and up to five schools each year in the future. This policy, according to the coalition, disenfranchises Milwaukee voters, many of whom are black and Hispanic, by stripping authority from the elected school board that oversees Milwaukee public schools and handing it to someone who does not exclusively represent the city or the district. An MPS spokesman said school district officials are reviewing the legislation in order to understand the impact it may have on students. “With some schools already in session and the traditional school year rapidly approaching, our focus is on ensuring that all of our schools are ready to receive students on day one,” MPS spokesman Tony Tagliavia said in an email. The state budget also decreased the ability of the Milwaukee County Board to oversee the sale of some county-owned property and expanded the state’s school voucher program, which allows parents to use public money to send their children to private schools. The coalition is calling for state lawmakers to overturn the laws and for Abele to appoint a commissioner who opposes privatization of public schools. Coalition leaders also said they plan to publicly show their disapproval with the new laws, including staging “walk-ins” this fall at a number of Milwaukee Public Schools, where parents, teachers and students will show their unity by walking into school buildings together. “We have to resist. We have to fight,” said Jennifer Epps-Addison, a mother of two MPS students. Epps-Addison said she was involved in a sit-in at the office of then-governor Tommy Thompson, who was planning to take over the city’s school system when she was a 15-year-old MPS student. Epps-Addison said the educational system for decades has perpetuated failing schools for blacks and minorities in order to take advantage of them as under-educated members of the labor force. “We can’t have functioning schools for black and brown people because those are the folks we need to exploit in order to make billions and trillions in profits. That’s how the system was designed,” she said.